JUST about anyone who has ever watched the news or picked up a newspaper knows the name of Kofi Annan – he is quite possibly the most famous non-statesman in the world of global governance. And yet, few people are aware of the Kofi Annan Foundation – the organisation he set up following his retirement as Secretary-General of the United Nations. The perceived “quietness” of the foundation, however, is indicative of the subtle yet highly effective methods it employs. Who needs to shout when you have the ear of almost all of the world’s leaders? Following his retirement, Mr Annan still felt keenly that there was much work to be done in the world and set about creating a foundation that acts as a completely independent advisory and intermediary to governments and groups around the world. 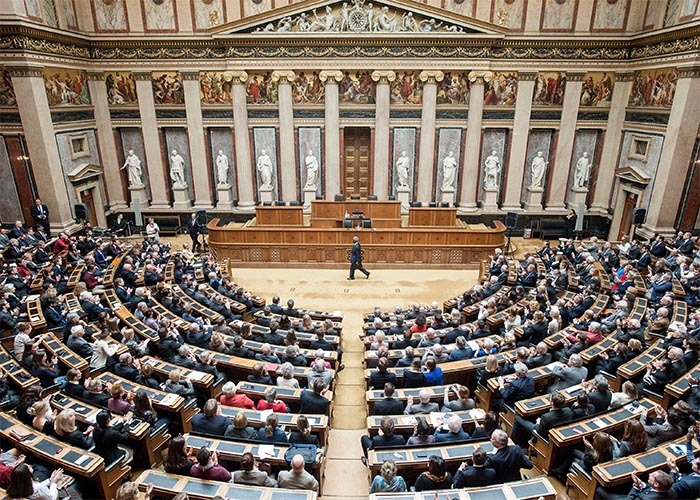 The foundation’s principles are very simple: “To promote better global governance and to strengthen the capacities of people and countries to achieve a fairer, more secure world” with their focus areas being peace and security, sustainable development, and the rule of law and human rights. Alan Doss, Executive Director of the foundation and Mr Annan’s right-hand man, talks us through the crucial work being done, through private meetings and public addresses, to encourage our government and business leaders to do the right thing and, they hope, make the world a better place. Could you tell me what is the aim of the Kofi Annan foundation? It seems to be very multifaceted and involved in a lot of different areas. Yes, it is. We have different dimensions, but the core element, I would say, is about political will. Mr Annan has long believed that most of the problems that we face in the world today can be resolved. We have the knowhow; we even have the means, the financing and the technical expertise. The question is: are we willing to apply those resources to solving those problems that we face? It always comes back to ‘is there political will?’ Where there is political will, there is usually a way forward. So what we do is focus on trying to mobilise leaders in the world to bring to bear on some of the critical problems we face in the world today, whether it’s in the area of peace and security, of human rights or of sustainable development. That’s the core of our work, working to build that political will. We are doing it through the networks that Mr Annan has developed over the years, his power to bring people together, to speak out on issues. But sometimes it’s through very quiet diplomacy, so we use a range of tools to try to mobilise political wealth around some of the key issues that the world faces. How do you influence political will? If you have, say, a corrupt leader who is doing pretty well by being corrupt and having a nice lifestyle from it, how do you motivate them to give that up? I think there are various ways you do that. First, obviously one hopes that through diplomacy, through discussion, dialogue and debate one can get people and institutions to change their policies. Sometimes you need to throw a very public light on the problem – the problems that may have been ignored, or which governments or individuals or groups are trying to cover up. You try and do it through public communication, sometimes through the modern tools of social media and so forth, but sometimes it’s about private conversations. So people become aware that there’s an issue or problem that needs to be solved, and you try and convince them that this should happen. It doesn’t always work, I mean, let’s be honest. Sometimes you have people that are very intransigent. We’ve been working quite a lot over the past six months to try to convince the President of Burundi that he should respect constitutional term limits. Together with many others, such as the African Union, the East African Community and various civil society groups and government, we have tried to convince him that for the sake of his country, to avoid violence – which would really have a huge impact on Burundi and indeed on his region – that he should step aside, but we have not been able to convince him. We will see what the consequences will be. So sometimes it does work and sometimes it doesn’t. 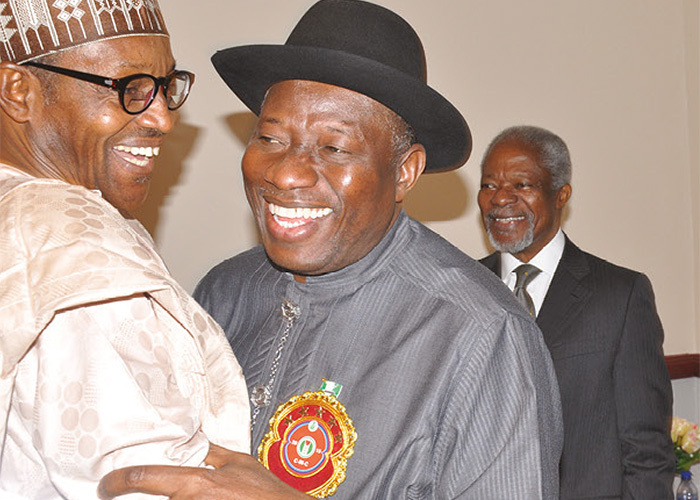 Recently we were very pleased, for example – on the other side of that balance sheet – in Nigeria. Working with many other partners – we don’t work alone, it’s one of our principles not to work alone but to work with others who are interested, concerned and have access – we were engaged to get the two leading presidential candidates together to meet to agree on a charter of nonviolence and to respect the peaceful resolutions to any disputes. And the elections went off very well, without any major violence. That’s a huge step forward for Nigeria, but also for the whole of Africa because, of course, Nigeria is by far and away the biggest country population-wise and even its economy now is the largest in Africa. So sometimes these things work, sometimes they don’t, but you have got to try, and sometimes it does take a long time. It can’t always be quick and instant. There has to be a consensus sometimes for the change and reform that’s needed. So that’s the way we go about things here, and, as I say, we do work with a lot of other groups of people, individuals and institutions. How many countries does the foundation operate in? We don’t deliberately have a permanent physical presence in any given country. We have a small headquarters (in Geneva) and we work with organisations that have a presence on the ground, whether they’re international organisations like the United Nations, or regional organisations like the West African Economic Community or the African Union. We also have close collaboration with a number of major international campaign groups who are working on issues we’re engaged with, such as the International Crisis Group, the Centre for Humanitarian Dialogue based here in Geneva. So because we think there’s a great deal of information and knowledge out there, we don’t need to duplicate that. What we have to do sometimes is bring it together, to deploy it in support of policy change and to mobilise the political will that is so often needed but missing when it comes to making those changes. Obviously Kofi Annan is only one person; do you have team members who supervise and oversee things when he can’t be there? We can deploy from our staff here in Geneva; we’re a very small staff. Mr Annan himself, above all, is often travelling. He will meet with leaders in their own countries but also in different international forums. For example, just yesterday he was in Paris by invitation of President Hollande to give an address on climate change in the run up to the major climate conference that is going to open in Paris in late November, and he spoke there about why climate change is so important and what needs to be done to head off the very clear and present danger. So these are major global events that he’ll be present at, but then we also do a lot of missions underground. We were in Nigeria – I was there to talk to the government and leaders about the elections. Subsequently we were in Colombia and Cuba talking to the government and the rebel movement about bringing peace to Colombia. Again, we worked with other organisations – in the case of Colombia in particular, with the Norwegian and Cuban governments who are facilitating the peace process. So we don’t need to be everywhere; we work with organisations, with groups, with governments who are present and who often have very large teams on the ground and we look to see where is the value that we can bring to any process that’s either underway or that needs to be started. Sometimes it can be a major speech or television appearance. Last year, when the Ebola crisis was at its height, Mr Annan was very outspoken on the need to provide the required assistance, and he also made the point to African leaders, ‘Don’t close your borders to these countries. That would be wrong and would also make the epidemic worse.’ We also said to them, “Don’t be shy about taking assistance, even if it comes in the form of military support, because right now the situation is so critical you need all the help you can get.” But he also spoke very publicly in places like New York City against countries that were preventing the return of their nationals and putting them in quarantine simply because they’d been in an Ebola-infected country. He felt that was wrong, it was a wrong signal and it would be unhelpful. So, again, we are fairly flexible in the way we work, depending on the issue and depending on the urgency of that issue. What are your criteria for getting involved in an issue? The principle is, can we add something? We get asked a lot of times to intervene. We look at each request very carefully and I have to say that a good part of the time we decline politely because we don’t feel we can help very much or we simply do not have the capacity. We are a very small foundation and we intend to stay that way, which means that we have to be quite selective and try to put our efforts behind others. Could you tell me a little about the foundation’s work to end hunger? We’ve got a very specific initiative underway now which has a rather long name – a better title would be African Farmers’ Initiative. As you can well imagine, Mr Annan follows the issues throughout Africa very closely and has long been concerned about African agriculture – that Africa still doesn’t feed itself. It imports about 34 billion dollars’ worth of food every year. It’s phenomenal isn’t it? I mean, that’s between all the countries, and much of that is commercial; it’s not all food aid. But if you lump them together, food aid and commercial, then commercial purchases are very significant. And this in a continent that really should, and could, feed itself and be a granary for the rest of the world – which it had been in the past. African agriculture, of course, is more than about food crops; it’s also about cash crops. We want to focus in particular on food crops and help African farmers, small farmers, become more productive. This is not only to give them a better income, but also to help them produce crops with higher nutritional content to help reduce malnutrition – which is still, unfortunately, very prevalent in much of Africa. And that, of course, has an effect on the life of a child. We’re looking to do it in a rather different way, by asking, ‘How can we involve the private sector here?’ In the private sector, business has the potential to be both a major client for African farmers but also a source of technology. Obviously this has to be done with care; we’re not talking about just pushing African farmers off the land so big multinationals can come in and put in plantations where previously there were millions of small holders eking out a living. What we want to do is try to move them up, if you will, the value chain. Get them to produce crops more efficiently so they can better feed their families with food that has a higher nutritional content. Even in traditional crops the nutritional value can be improved from better seeds and so forth, but again it’s not about trapping African farmers in the hands of major food corporations; what we want is to get a compact, if you will, so that the technology, the resources and the purchasing power of major corporations, African and others, can be used to promote and boost the productivity of African farmers, particularly in the area of food crops, so that they get a better income and a better product for their families. So we’re working with a group now of like-minded people such as the World Food Programme – which, by the way, is a major purchaser of African food now. It has a policy to buy food locally, wherever possible, to meet its needs, which is great. I think it’s a great step forward. We are working closely with them on this but also with other business companies that have an interest in these areas – as I said, under certain conditions. Local entrepreneurs from Africa, and other groups such as the Alliance for a Green Revolution in Africa, the Bill and Melinda Gates Foundation, so a group that is really intent of seeing how we can improve the productivity of small African smallholders and their families. And, by the way, many of those smallholders are women. African farmers are disproportionately women and it’s really important because women are the breadwinners of many African families. So you see there are many potential positive knock-on effects on the quality of life, and also by raising incomes because not many farmers can keep their children in school or can afford to improve their own living standards – which is all crucial to the future of Africa. We’ve been working on this now for some time, building a consensus and building a partnership around those ideas. Do you think that if this idea gets off the ground you could export that system to other countries or other continents? We’ll see. I don’t think we want to get ahead of ourselves. One of the elements I should mention that we’re trying to build into this is the whole notion of climate-smart agriculture. Africa really is a negligible contributor to the problem of global warming; less than two percent of emissions creating global warming are coming from Africa. But Africa will be disproportionality affected, according to climate models, by global warming and the rise of global temperatures. So we could see an increasing and accelerating desertification in Africa. Africa is still primarily rural, dependent on agriculture for food as well as certain exports, so it’s very important that African farmers start to develop responses in anticipation of what may happen. I hope we can dent it; but we can’t totally reverse it, at least not immediately, so it would be totally unfair, seeing as Africa isn’t really contributing at all historically or in the present time to global warming, that it would be a continent that suffers disproportionality, even catastrophically, from global warming. What successes or achievements has the foundation been able to claim? Some of them I think are fairly well known. In my experience, success is never attributed to a single individual or a single institution, particularly if you need to change policy and so forth; it’s always a combination. But I would say we contributed significantly to making sure the Nigerian elections went off well. I think we’ve contributed, for example, with Colombia and helping them set up a truth commission. Colombia has gone through a 50-year civil war, which is still on-going, although we hope it’s now coming to an end through peaceful negotiation. But the truth is that history casts a long shadow and it’s very important to know what happened, because if you don’t, it’s very hard to go forward to reconciliation and to rebuilding society. So we’ve had a very interesting initiative to look at what’s been the experience with the so-called truth commissions and on that basis we helped advise the Colombian government on how to set one up. We’ve had to deal with a tough, complex issue because when a conflict goes on for fifty years a lot of blood has been spilled and a lot of people are involved and how are you going to handle that because you have to get past that in order to go forward. I think our work on the Ebola crisis was very important. Mr Annan spoke out loudly and clearly both to African leaders and to Western ones. I think he’s helped us to flag the importance of taking immediate action on climate change and in particular its impact on Africa. The initiative that this is getting off the ground on African agriculture. 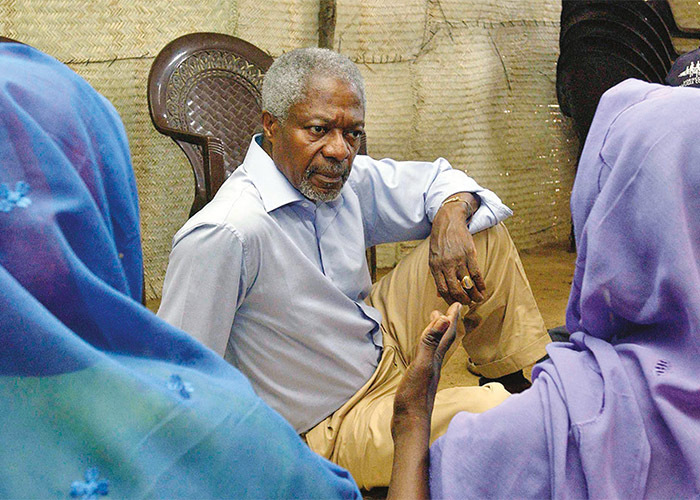 In the general area of peace and security Mr Annan was able, with the foundation supporters and others including the African Union, to have brokered the end of the conflict in Kenya that broke out after the elections in late 2007. He stayed with the process to 2012 which passed off, thankfully, peacefully without a rerun of the violence that created so many problems in the earlier elections. I’m just picking a few things where I think we’ve been particularly useful and helpful. And, as I say, some of the things we do we don’t talk about, because our value would diminish if we did, because then people wouldn’t trust us. Sometimes we do intervene on behalf of citizens, particularly on very sensitive areas like human rights, but we have to do it quite unobtrusively in order to get a result. But we have, I can assure you, intervened on numerous occasions to help individuals but also to help groups as well. What has been your proudest moment, or given you the greatest sense of accomplishment since you joined the foundation? I think we have to be willing to provoke a debate and be willing to ask some tough questions of ourselves and those who engage in these processes. 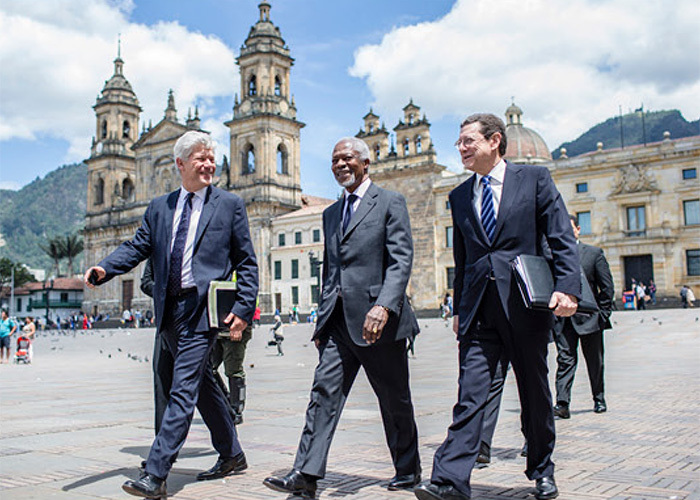 I’ve been very keen to push that, and to support Mr Annan’s own efforts, of course, above all, to bring some of these issues to the table and to make sure that we work to prevent or resolve conflict like in Kenya, like we’ve tried to do in Nigeria and Colombia and several other places where this work is on-going. And how did you meet Mr Annan, and did he say, “Hey I’m setting up this foundation”, and persuade you to come and join him? I met Mr Annan first when we were both at the United Nations in New York. He was, I have to say, several levels above me. He was already the assistant secretary-general for finance managing and all that area; this was in the early 80s. I was then the director for a special UN operation in Thailand, which was helping the Khmer refugees from Cambodia who’d fled during the genocide and during the war after Vietnam invaded Cambodia. I was the director of the operation that was running the border and then the peace agreement and so we had a meeting in New York to decide on the future and the financing of this operation; and what would happen to the funding was all under discussion. Mr Annan was at that meeting; I was perhaps less visible at that one. But then I met him subsequently on various occasions and I was actually hosting him on his last official overseas trip as secretary-general. That was in 2006, when I was his special representative in Liberia, where we oversaw the end of the war and the transition to an elective government. And in fact that was when the first woman was elected as head of state in Africa, Ellen Johnson Sirleaf, so he came to congratulate her. That was his last field visit and it was a great pleasure. And then after I had just retired, I was doing some academic work at the Geneva Centre for Security Policy and he called me up and said, “Would you be interested in coming over as senior political advisor at the foundation?’ So I said, ‘You can’t refuse Mr Annan” – that’s a well-known saying in the UN and beyond – so I was delighted to and he asked me to stay on as the Executive Director of the foundation. From the Glass Archive – Issue 25 – Freedom. To make sure you never miss out on a copy of Glass, please visit here to subscribe.